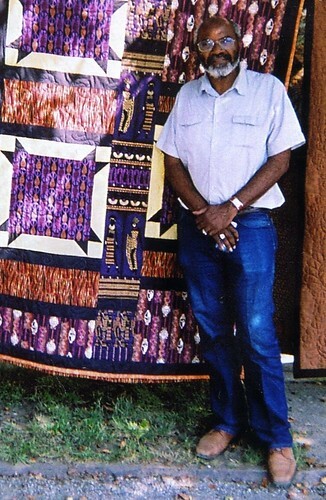 Abayomi Azikiwe, editor of the Pan-African News Wire, standing next to a quilt at the Detroit Bead Museum on the city's west side in September 2008. (Photo: Omorose), a photo by Pan-African News Wire File Photos on Flickr. This special broadcast featured reports from the Pan-African News Wire related to developments in South Sudan, Madagascar and other African states. During the second half of the program, we interviewed Norman Otis Richmond, longtime bluesologist and resident of the city of Toronto, Canada. Richmond has been a broadcaster and cultural worker in Canada and the United States for many years. The focus of our discussion with Richmond related to the passing of African National Congress leader and former South African President Nelson Mandela. Richmond along with many others in North America were organizers for the cultural boycott against the apartheid regime which played a role in the isolation of the racist system in Southern Africa.